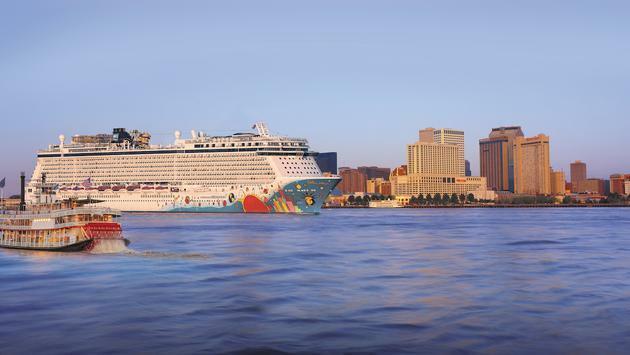 WHY IT RATES: The recently renovated Norwegian Breakaway is the largest cruise ship to homeport in the city of New Orleans, as well as the youngest in port this season.—Mia Taylor, TravelPulse Senior Writer. On November 11, 2018, Norwegian Cruise Line, the innovator in global cruise travel, returns to New Orleans, introducing Norwegian Breakaway to the Big Easy with five to 11-day cruises to the Caribbean. At 1,068 feet and 145,655 gross register tons, the recently renovated Norwegian Breakaway is the largest cruise ship to homeport in the city of New Orleans, as well as the youngest in port this season. The namesake ship of the Breakaway class offers guests the freedom and flexibility to design their dream vacation at sea with no assigned dining and entertainment times, 25 dining options, 22 bars and lounges, a comprehensive water park featuring the fastest waterslide at sea, one of the largest ropes courses of any ship and an entertainment program that mirrors the vibrancy of the Big Easy. Following her renovation in May 2018, Norwegian Breakaway debuted refreshed staterooms and public areas and introduced a new bar and lounge concept to the fleet with Syd Norman’s Pour House. Modeled after influential rock houses such as CBGB’s, The Rainbow and The Fillmore, Syd Norman’s is a tribute to the grandfather of “Rock of Ages” playwright Chris D’Arenso and features vintage décor, diner-style seating, signature cocktails and an unforgettable playlist of classic rock from the late 1960s to 1980s. Additional entertainment options on board include the Tony Award-nominated Rock of Ages, Burn the Floor and Cirque Dreams Jungle Fantasy, all of which attest to the company’s commitment to providing world-class entertainment at sea.